I fly South (culinarily speaking) for Easter. Specifically, I (re)visit New Orleans every year for my Easter Dinner. This link bears only a tangential relationship to logic, and has more to do with a sequence of free association that drifts from Mardi Gras to New Orleans to Lent to the joyous celebrations that accompany the end of Lenten fasting (assuming you were being abstemious during Lent, which I can’t claim I/we were) and back to New Orleans because those are folks who know how to throw a good party. Strictly speaking, I also associate Easter with tiny grilled lamb chops consumed by the half dozen in small beach side restaurants in the Peloponnesus. However, lacking (in no particular order): a beach, a wood fired grill, a sufficient percentage of Dinner who would be excited about the concept of tiny lamb chops, or a grizzled Greek man to cook my lamb chops to rosemary charred perfection (okay, that sounds vaguely obscene, apologies) I settled for a traditional New Orleans brunch dish of Grillades and Grits to celebrate Easter this year*, and will quell my craving for lamb cooked by Greek patriarchs at the next Greek festival at the Orthodox church up the street. The first written recipe for Grillades appears in the late 1800s in a cookbook (possibly the first edition of “The Picayune’s Creole Cook Book” although I can’t find definitive evidence of this). For it to have made it into a cookbook at the time, it must have been around and well loved for some time before that. Having now made it, I can see why. Contrary to the name which both sounds like it ought to involve grilling meat, and is in fact derived from the French verb “to grill”, grillades are not grilled at all, but are in the words of one blog, “braised into submission”. Traditionally grillades are slow cooked medallions of veal, although modern cooks often use beef or pork instead. Whatever cut of meat you use, you slow simmer it in a spicy tomato gravy and serve it over grits. Opinions vary about whether your grits should be cheesy, or more simply lightly buttered. 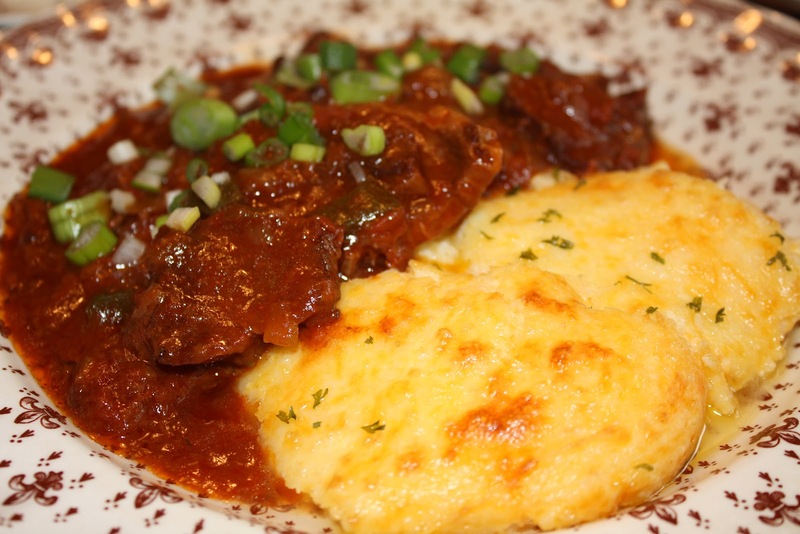 I deployed both butter and cheese for my grits, but made up for the break with tradition by finding and using boneless veal shoulder for my grillades. * We celebrated Easter a week early because I’ve had Easter candy sitting in a bag on the floor of my bedroom for about three weeks now and there’s only so much self-restraint I can deploy in the face of Cadbury Mini Eggs and Jelly Beans. Also, there’s a Birthday Dinner coming up at the end of the month and I like to give us at least a week in between epic desserts. (note – I completely failed to take an attractive picture of the grits & grillades I served – I blame the sketchy lighting in my dining room. However, the dish is to pretty and too tasty to go without an image – so, please credit Fleur de Lolly for their excellent picture taking skills for the image below. Trim any hard fat and/or silver skin from the veal. Cut the veal into thin(ish) slices – or into 1” cubes (if you can figure out how to cut a boned veal shoulder into slices you’re doing better than I am – I cut mine into largish chunks and called it a day). Mix 1 ½ tsp creole spices with the flour, and reserve 1 Tbsp. Cook the bacon in a heavy pan until crisp. Remove and drain on paper towels. Drain the rendered bacon fat from the pan and reserve. Toss the veal with the seasoned flour. Add a little of the rendered bacon fat to the pan and brown the seasoned/floured veal in batches, adding more bacon fat as needed (you may need to use some vegetable oil in addition, it depends on how much fat your bacon gave up). When you have finished browning the veal, add the onion to the pan and scrape up any browned fond. Season with salt and pepper, and saute over a medium heat until softened. Add the bourbon and honey and continue to cook until the onion is caramelized (if you don’t have bourbon on hand you can substitute another alcohol of choice like white wine, or sherry, or apple brandy; if you don’t want to use alcohol you could substitute apple juice or the juice of a juicy orange, or just some water or stock – although if you use just water or stock you might want to use a little more honey). 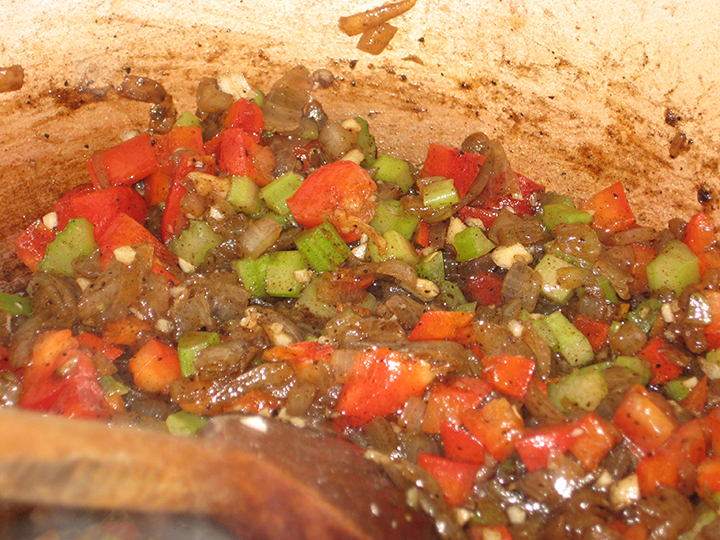 Add the red pepper, celery, and garlic and continue to cook until the vegetables are tender (about 5 minutes). Sprinkle the reserved 1 Tbsp seasoned flour over the vegetables and cook until the flour has browned slightly. Add the tomatoes and stock and stir to combine. Add the reserved bacon, thyme, bay leaf, red pepper flakes, and Worcestershire sauce. Bring to a simmer and return the veal to the pan. Cover and simmer for about 45 minutes, or until the veal is very tender. Adjust seasoning to taste – I added some lemon juice and a little more honey to temper the spiciness. You can add Tabasco if you want more kick, but I thought the sauce had plenty of kick already. You can make this in advance and refrigerate overnight. Skim any excess fat from the surface of the braise before reheating. Warm over a medium heat for 30-40 minutes, or until the meat is heated through and the sauce is bubbling. Serve garnished with sliced scallions, and served over (or beside) cheesy grits. Grits are basically a blank canvass (they’re also basically the same thing as polenta just with a different cultural heritage). You can be a purist and eat them just plain topped with a (large) pat of melting butter, and generously seasoned with salt and pepper. You can go a sweet route and drizzle them with maple syrup. You can opt for a more savory approach and stir in jalapenos, or cheese, or both. Personally, I like grits pretty much any way you cook them, and completely fail to understand how my mother can be so vehemently opposed to them. You can make grits with all water, or all milk. I like a combination of milk and water in about a 1:2 ratio (1/3 cup milk : 2/3 cup water), but you can play with that depending on how creamy you’d like your grits. 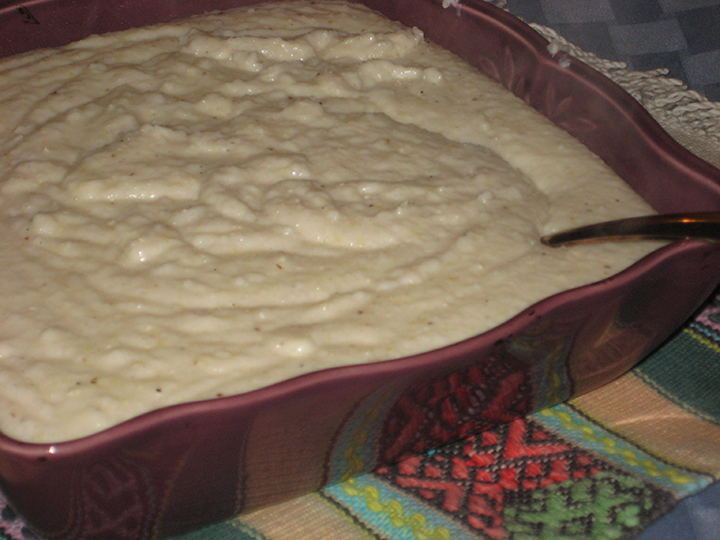 Grits cook in a fairly strict 1:4 ratio (1/4 cup grits : 1 cup water/milk). If you want to decrease the recipe just make sure you maintain the proportions of grits to liquid. You can always add more liquid, it’s rather harder to remove it. Bring the milk and water to a simmer in a heavy bottomed sauce pan. In a slow stream whisk in the grits, salt and pepper, whisking until there are no lumps. Cover and simmer for 25-30 minutes, whisking vigorously every 5 minutes. Add additional water as necessary to smooth out/loosen up your grits (I ended up adding about another 1 cup of water over the course of cooking). When the grits are creamy and tender, whisk in the butter and cheese. Season to taste with additional salt and pepper, and allow to cook for another 2-3 minutes. Serve immediately.